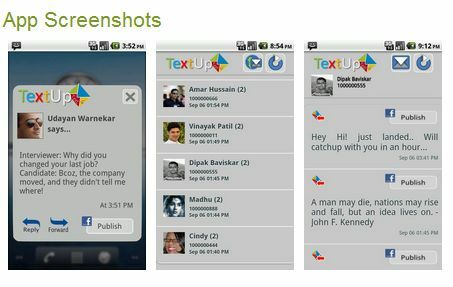 Now we can send and share your android mobile SMS on facebook with the help of TEXT UP application. 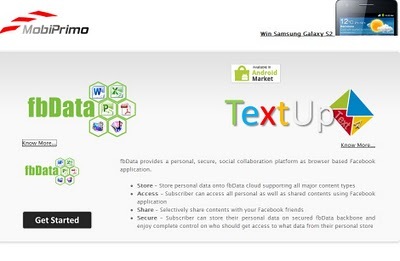 Now click on Get started and start sharing SMS with Facebook. Fbdata.com is a lood looking featured website which provides the applications for social networking website.Form these application we can store ,view ,conversation ,search ,messages,and send the SMS from our mobile phone.These application for FACEBOOK. fbdata.com and these applications are designed by MOBIPRIMO technologies, pune, India.Its give a application TEXT UP from whioch we can share SMS on facebook. This application is totally free but its supports only Android devices. Company acquired by Pubmatic Inc.